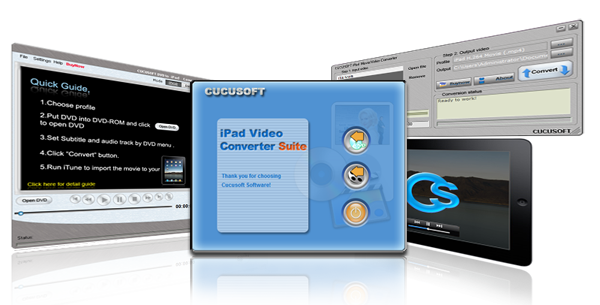 Cucusoft iPad Video Converter Suite is an all-in-one iPad video conversion solution. 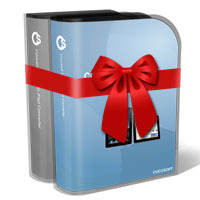 This software suite includes two conversion packages, the “Cucusoft iPad Video Converter” and the “Cucusoft DVD to iPad Converter“, so with this single package you can convert both DVDs and video file media to iPad video and iPad movie formats.You will be able to enjoy your favorite DVD movies and video clips on your iPad wherever you go. • Supports various iPad video sizes including H.264 video up to 720p, 30 frames per second, Main Profile level 3.1 with AAC-LC audio up to 160 Kbps, 48kHz, stereo audio in .m4v, .mp4, and .mov file formats; MPEG-4 video, up to 2.5 Mbps, 640 by 480 pixels, 30 frames per second, Simple Profile with AAC-LC audio up to 160 Kbps, 48kHz. • You can convert almost any kind of DVD to iPad. • Split your output video by DVD chapters and titles. Fully supports MTV DVDs and episodic DVDs. • You can customize the output file size and corresponding video quality. • Easily customize the various video settings such as brightness, bit rate, etc. • Select the subtitle and audio track language. • You can crop your video to 16:9, 4:3, full screen, etc. • You can resize your video. • Converts DVD to MP3 audio. Supports Dolby, DTS Surround audio track. • Converts to the latest iPhone, 4th generation iPad nano, nano chromatic, 2nd generation iPad touch, and Apple TV. • Supports "Drag and Drop" interface. • Cool UI skin available.